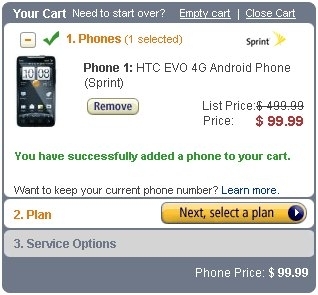 Sprint EVO drops to $99 on Amazon.com | Android Blast! The Sprint EVO 4G was the talk of the town last summer, but as other Android phones come to market the EVO must take its place towards the back of the line. Amazon is now offering the EVO for $99. That's a pretty good deal on the EVO which still has a ton of features. It sports a fast 1GHz processor, front and rear facing cameras, 4G hotspot, and a 4.3 inch display. Head on over to the link below if you want to start new Sprint service and get a great deal on a solid Android phone.